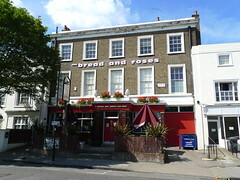 Decent pub in Clapham, run by the Worker's Beer Company. Situated five minutes' walk from the noisy bars on Clapham High Street, this is definitely worth an afternoon/early evening visit if you enjoy a variety of well-kept beers and speciality lagers. The staff are friendly and competent, and the clientele varies from families to locals. There's a small amount of covered seating out the front, but the bulk of the outside seating is in the larger beer garden at the back, reached via the conservatory at the back of the pub. On our May 2009 visit, we noted that the beer garden has barbecue facilities too. Upstairs, there's a large function room which is available for hire. The back room has a big screen showing Sky Sports throughout the day. Kake and Ben popped in for a swift half on a Wednesday afternoon in May 2009. Real ales available were Cottage Brewery Norman's Conquest, Sharp's Doom Bar (the regular, according to the Bread and Roses website), and Sharp's Eden. The handpumps had tasting notes attached photo, a nice touch. A half each of Norman's Conquest and Eden came to £3.20. Kat and Rick paid a longer visit a year or so earlier, on a Saturday evening in December 2007. The taps included Sharp's Doom Bar, Adnams' Yuletide, Budvar Dark and Poretti lager. One of our party also had a bottle of Brother's Pear Cider (4.7%, not festival strength). We also had bowls of cashews and wasabi-coated nuts for £1.50 each. At around 9pm, a DJ started playing old soul and reggae records at a volume just over the acceptable chatting threshold. We also tried the food, which arrived very promptly. Kat had a rather filling vegetarian jambalaya (aubergine, courgette and pumpkin), which came with two slices of toasted ciabatta and a choice of side dish (the spicy wedges were crispy but not very spicy) for £7.50. Rick had a burger with cheddar, salad and a side order of chips for £7.50. The menu seemed rather limited but all the options looked appealing; we were too full for dessert but the chocolate brownie was tempting. According to the Bread and Roses website, as of May 2009 food is served 6pm-9:30pm Tue-Fri, noon-4pm and 6pm-9:30pm Sat, and noon-6pm Sun. No food on Mondays. Sunday food is a full roast at lunchtime, including (as of December 2007) a vegetarian option of nut fritters. As of September 2010, there's a quiz on the first and third Wednesday of the month, 8pm start, £2 per person, max 6 people per team (according to the Bread and Roses mailing list). Last visited by Kake and Ben, 20 May 2009. Opening hours taken from sign outside, May 2009. Food times taken from the Bread and Roses website, May 2009. Last edited 2013-05-10 06:48:32 (version 17; diff). List all versions. Page last edited 2013-05-10 06:48:32 (version 17).